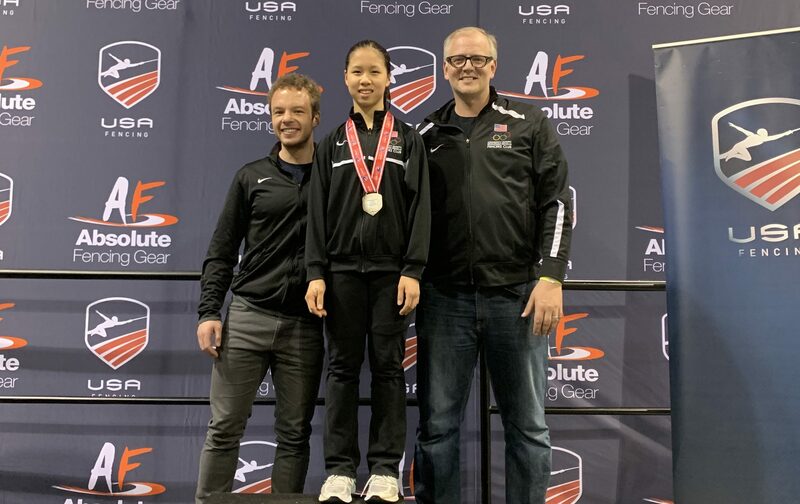 Lam is a top-20 fencer in both the cadet and junior foil divisions after winning two medals at the 2019 Junior Olympic National Championships in mid-February. Editor’s Note: Each month from September through June, The Cherry Hill Sun will select one athlete from Cherry Hill High School East or Cherry Hill High School West as its Athlete of the Month. At the end of many school days, when most of her classmates are heading home on a school bus, Cherry Hill High School East sophomore Justina Lam is heading to the train station. Four days per week, Lam makes the commute to New York City, where she trains at the Fencers Club. Lam typically trains about two hours per day and will then take the train home, only to start the entire process over again the next day. All of Lam’s efforts have paid off in a big way. On Feb. 15, Lam traveled to the 2019 Junior Olympic National Championships in Denver and won two medals. Lam won a silver medal in the cadet women’s foil, which is the division for women 17 and under, and a bronze medal in the junior women’s foil, a division for ages 20 and under. This achievement is just the latest for the 15-year-old Lam, who is developing into one of the top young female fencers in the country. Lam first began fencing locally at the age of 9. When she turned 11, Lam started training at Premier Fencing Club in Central Jersey, where she began her journey in moving up the fencing rankings. As she began to fence more, Lam fell in love with the competition and the intricacies of the sport. A little more than a year ago, Lam moved to Fencers Club Inc. in New York City, one of the top clubs for women’s foil in the country. At Fencers Club, Lam is coached by Sean McClain and Alex Martin, two accomplished coaches who have had numerous fencers medal in both national and international tournaments. Lam admitted balancing fencing, school and her home life isn’t easy. On days where she trains, she spends virtually her entire day in school, at fencing or commuting. Despite this schedule, Lam loves training at Fencers Club. She credited the club and her coaches for her outstanding performances over the past year. Lam said her technique and understanding of strategy have improved over the past year. Lam entered the 2019 Junior Olympic National Championships well prepared for a long and grueling weekend. At the competition, each division’s tournament is completed in one day. The fencers first participate in six pool play matches to seed the bracket. After pool play, a single-elimination tournament takes place. Each division includes well over 100 fencers and the single-elimination bracket consists of eight rounds. Lam was one of the top 50 seeded fencers in the cadet women’s foil after going 5–1 in her pool. After getting a first round bye, Lam went on to win six consecutive matches to reach the finals. While Lam would fall in the finals to Nicole Pustilnik, she was thrilled to have made the podium. After Lam’s silver medal performance on Feb. 15, she returned to competition on Feb. 17 in the junior women’s foil tournament. In that competition, Lam went undefeated in pool play and was one of the top seeds in single-elimination. She would reach the semifinals before suffering her first loss of the day, giving her a bronze medal. Lam’s outstanding performance at the Junior Olympics has boosted her rankings. Lam is now ranked ninth in the country in the cadet women’s foil and 19th in the junior women’s foil. Now, Lam is preparing for another big jump in her career. She is preparing to compete in the senior division for the first time at her next competition in Anaheim, scheduled from March 15 through March 17. The senior division is the highest level of competition in fencing, and while Lam recognizes it will be a challenge, she is ready to take it on.